Tangier, dubbed the “soft crab capital” of the nation, is a unique island located in the middle of the Chesapeake Bay. If you would like to see an unspoiled fishing village with quaint, narrow streets, then take a step back in time and visit Tangier Island today! The people of Tangier, who speak with a lingering trace of Elizabethan accent, are warm, friendly and proud of their island. They live here because they like the lifestyle and have no desire to live on the mainland. Spend some time on Tangier. Visit by air or sea. Stay for the night in one of the delightful bed and breakfasts, or take a day-trip on one of the ferries. 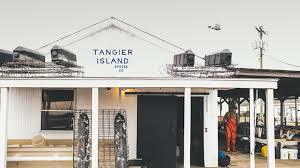 An experience on Tangier Island will stay with you for years to come. It might be small in population, but the people of Tangier have a great love of the Chesapeake Bay and each other. On your visit to Tangier Island you can enjoy one of the many award winning Tangier Island Restaurants, or spend the night in some of the oldest homes on the Island by booking a room in a Bed and Breakfast. Their are numerous gift shops and craft stores to make your visit memorable. You can also explore the Tangier Island museum to take a step back in time and relish in the diverse history of hard work that comes from living on a remote Island. Get pampered with one of our B&B’s or stay a couple of nights in a rental!